← Good Life. Good Time. For years I wanted nothing to do with this disease. Nothing. I was comfortable taking a backseat to my diabetes, ignoring it, denying it, full-on rebelling against it. I didn’t care to talk to anyone about it, and I sure as heck didn’t want anybody talking to me about it. And when it came to other diabetics, I wanted nothing to do with them. But my oh my how things do change. Earlier this week, when still in the Onterrible, I had an opportunity to meet with Scully, fellow blogger, long-distance runner, and type 1 diabetic. I was a little nervous going in. I’ve been reading her blog for a good while now and while I love her online personality, I had no idea what I’d be getting in the flesh. Over the years I’ve met a few diabetics who, truthfully, I couldn’t stand. For me, there’s nothing worse than the “know-it-all” diabetic trying to tell you everything you’re doing wrong. But Scully, she was nothing like that. The second Mario and I sat down with her at the coffee shop, the conversations started rolling and continued for two straight hours. Comparing pumps: She’s Medtronic. I’m Animas. We talked about life, about our running, our respective races (She ran the Missassauga Half on Sunday while I ran the Toronto Half), our blogs, and yes our diabetes too. Unlike me, Scully was diagnosed with Type 1 at 22 and gets rightfully disgusted when people still call it “juvenile” diabetes. She had contracted poison ivy and after weeks of itching, was prescribed a high dose of steroids. Within two days, she couldn’t see and her pancreas had shut down. And unlike my diagnosis when I was nine, where I was rushed to the hospital as soon as my moms told the doc my symptoms, she went two months – TWO MONTHS! – with no insulin, no glucose metre, no support, nothing! But the thing is, this chick is a fighter. Not only did she survive, she has seriously thrived, traveling the world, going on backpacking adventures, rock climbing, spin classes, and is now about to embark upon her first full marathon. Wonder. Woman. 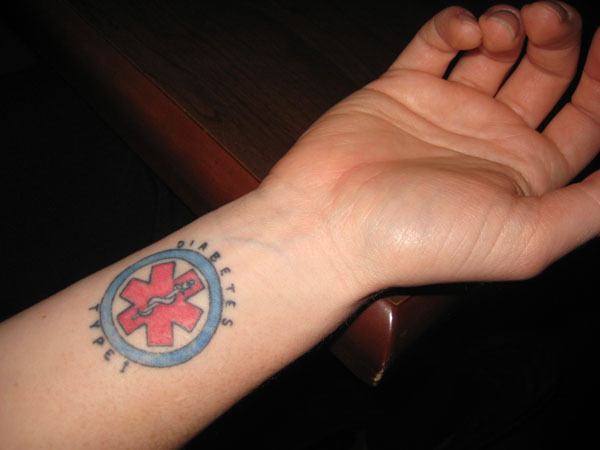 Forget medical bracelets, this chick designed her own medical tattoo! And even though Scully’s only had the disease for eight or nine years, she is so freaking knowledgeable about it. From her, I have discovered the beauty of upping my temporary basal rates post exercise to avoid a BG surge. I’ve learned how to waterproof my so-called waterproof pump – hello Duct tape! And the best tip of all: Giant Rockets! 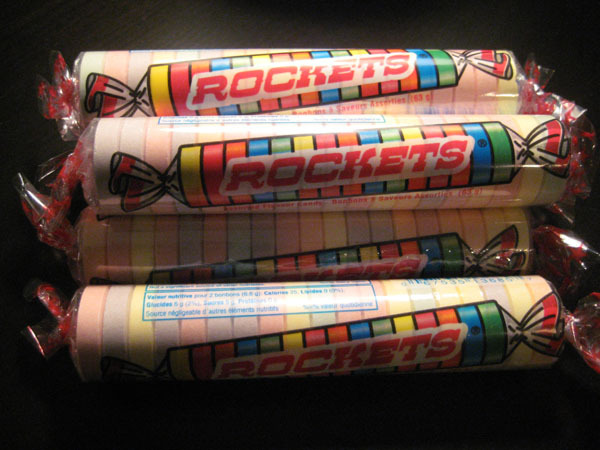 You know those cellophane wrapped halloween candies you’d get as a kid, well, turns out there’s giant ones on the market that act in almost the same way as DEX glucose tablets, (Three Giant Rockets = 9g carbs. Three DEX = 12g carbs) but unlike DEX, Rockets are a whole lot more tasty! Oh yes I did stock up! Brilliant! In just two hours, I learned so much more useful information than I have in probably the last five years of specialists appointments … and she was way cooler to talk to too! Why is it that such valuable people have to live so darn far away? 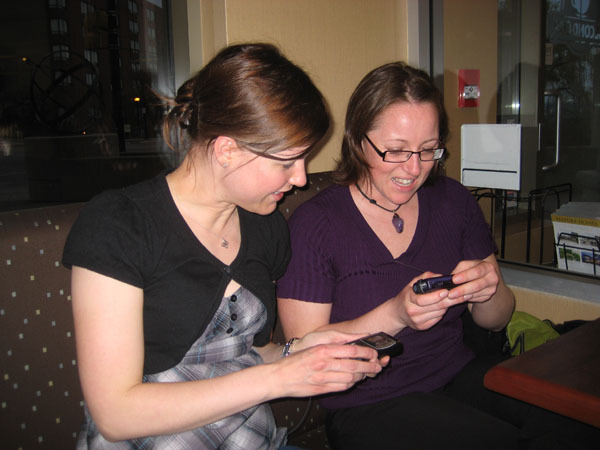 This entry was posted in Diabetes, Travel and tagged Animas, Insulin pump, Medtronic, Onterrible, Type 1 diabetes. Bookmark the permalink. OMG you are amazing. I am so totally blushing over here! words cannot express it. THANK YOU! We love Scully, she is such an inspiration and I love reader her running experiments. Meeting other bloggers is so much fun! And that tat is AWESOME. P.S. Your hair looks lovely!